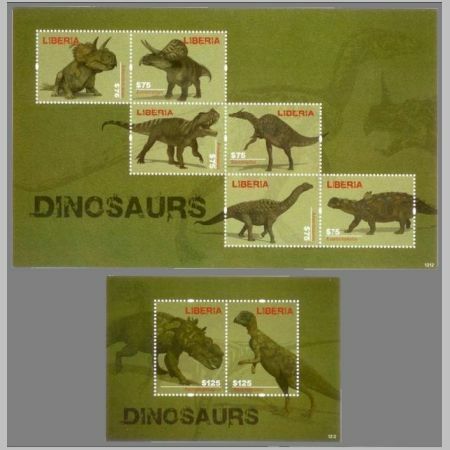 On 27 of July 2012 Post Authority of Liberia issued two Mini-sheets(MS) depicted some dinosaurs. The first MS containts 6 stamps with face value of LRD 75 (Euro 0.80 about). The second MS containts two another stamps with face value of LRD 125 (Euro 1.0 about). In fact average income pro person (GDP pro capita) in the country is about EURO 225 stamp price of Euro 1.0 or even Euro 0.80 seems to be too high to be really use for post pupose. Just to compare: average income pro person (GDP pro capita) of Germany is about EURO 30,000, but face values of stamps is between EURO 0.55 and EURO 2.60. When the stamps of Germany would be issued in the proportion to GDP pro capita as the stamps of Liberia it will have a face value of EURO 130 - EURO 160 !